. 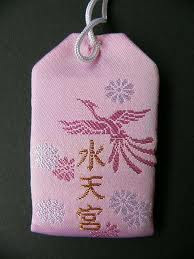 Anzan o-Mamori, 安産お守り Amulets for Safe Delivery . Sometimes, even a Kappa is some form of Suijinsama. 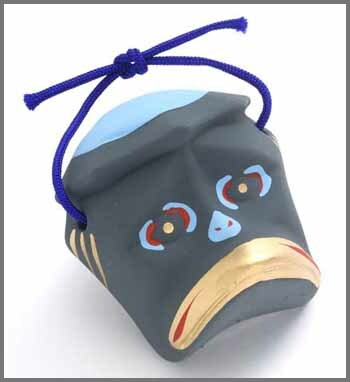 This is an amulet against water damage, fire and avoiding all evil.
. Kappa 河童　＜＞　The Water Goblin . In 1818, a branch of the original Suiten-gu Shrine in Kurume City, Fukuoka, was built in Edo (present day Tokyo), but it was moved to its present location in Nihombashi around 1872. This shrine embodies the Water Deity who brings smooth delivery of babies, protects children, and protects against drowning (安産・子授ける). 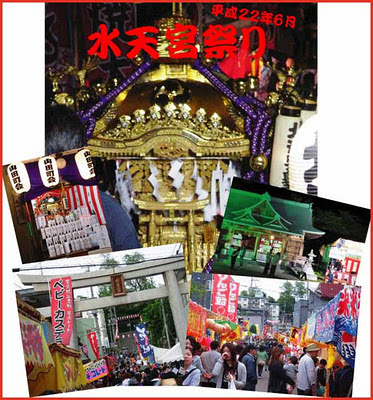 Like other Suiten-gu Shrines, it holds it annual spring festival on May 5th, which is its busiest day of the year. 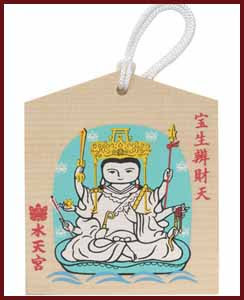 Benzaiten (the Buddhist goddess of fortune), is honored here as well. She is one of Japan's Seven Deities of Good Fortune. This shrine is also one of the sites on a local pilgrimage to the seven. 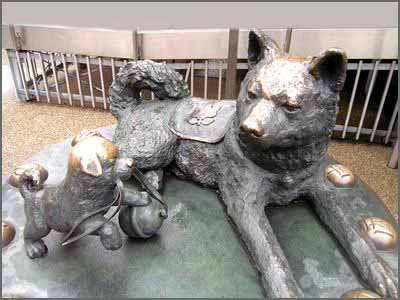 Another attraction of this shrine is its "Dog Deity," said to grant easy child delivery to those who touch it. Some say it embodies Oinari-sama, the god of rice and agriculture, whose messenger is the fox. 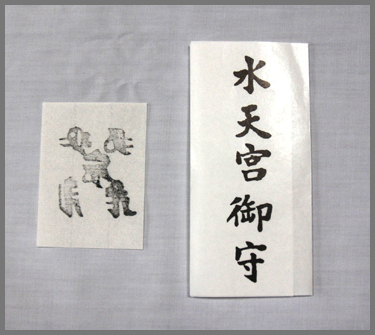 Devoted to the Deity of Water, known as Suijin or Suiten or Mizu no Kamisama. This Shintō deity, often a goddess, protects not only fishermen but also serves as the patron saint of fertility, motherhood, and easy childbirth. She is mostly worshipped at "Suitengū" shrines throughout Japan, and votive stone markers devoted to her can be found frequently in the countryside. 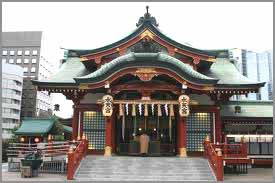 The Suitengū Shrine in Kurume (Fukuoka) is the main shrine of all Suitengū Shrines in Japan. Women come here on the day of the dog (inu no hi 戌の日) to pray. You have to carefully tear out the middle character, put it in your mouth, make a wish and swallow it with water. That way your body will be even closer to the Deity. It is also used if you do not feel well or a child is ill. Sawllowing one letter will bring healing. Suitengu is a shrine located in the neighborhood of Ningyocho where you can still capture the atmosphere of Shitamachi (old Tokyo). The shrine pavilion with its striking curving roof was built in 1967, using an architectural style known as "Gongen-zukuri". 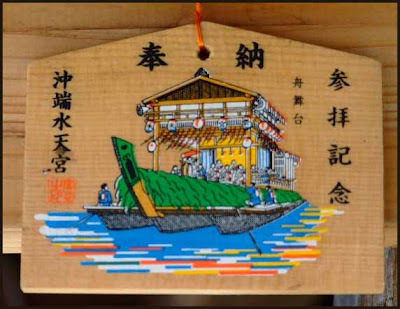 It has been gathering place for worship as the God of safe childbirth and blessing of pregnancy has resided here since the time of Edo period. 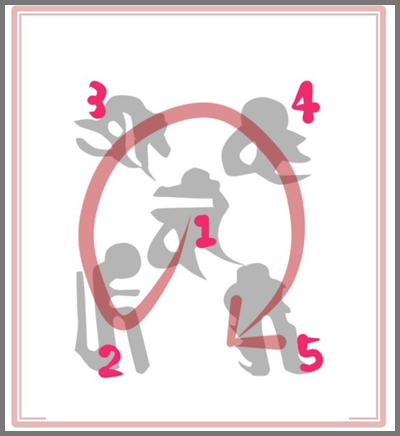 Prayer for "Anzan Kigan," hoping for the safety of mother and safe birth of a baby, and "Kosazuke Kigan" for having children are mainly conducted. There are always many worshipping of couples and their families praying for safe childbirth and pregnancy blessings, paying a visit of thanks, and providing baby's first shrine visit both on weekdays and weekends. Prayers for a safe delivery, protection from water damage and other catastrophies. 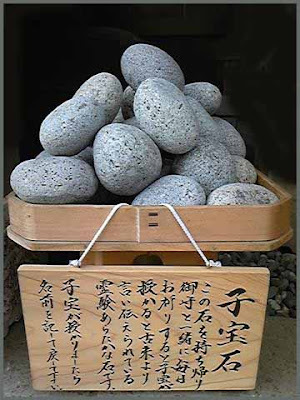 This stone must be put on the shelf of the gods (kamidana) for daily prayers. Put on a pink cushion, it can also be placed in the bedroom, with a prayer every evening. 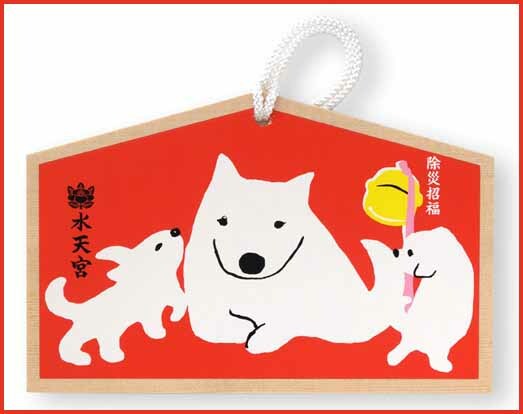 In the fifth month of a pregnancy, on the day of the dog (according to the lunar calendar) women go to a special shrine or temple to get this amulet and a bandage to wrap around the body. Usually the mother buys it for her pregnant daughter. ... in her fifth month of pregnancy and on Inu-no-hi (戌の日 / Day of the Dog), the mum-to-be will perform the Obi-iwai. She will bind her tummy with the cotton sash to ensure safe and easy delivery of her child. 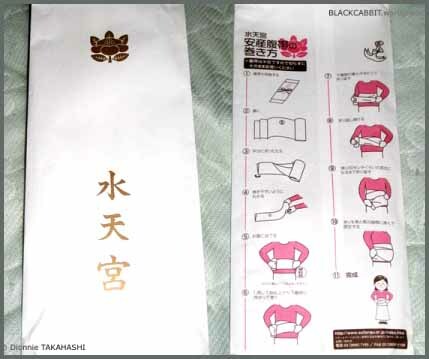 Interestingly, dog seems to play a big part in the sash-binding ritual. Mostly because of the belief that mummy-dogs give birth to little puppies with ease and hardly any complication. 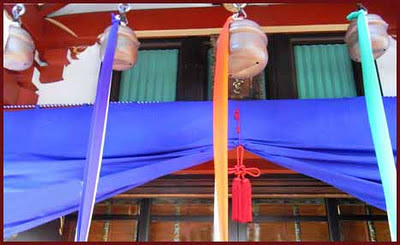 So the doggy days are considered auspicious days to do the bellyband ceremony. Sold at the Benten Shrine in the compound. The servant of Benzaiten is the serpent.
. The Water God Suijin-sama 水神様　.
. Three Female Deities of Water. Female deities to protect the mothers.
. Anzan Daruma from the Suitengu Shrine .
. Shrine Tamaki Jinja 玉置神社 .
. Suitenguu Matsuri 水天宮祭 Festival at Suitengu shrines . This is the last of the monthly prayer days (ennichi　縁日) for the year. 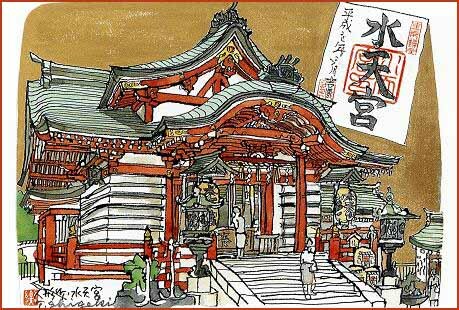 A great fair is held and many visitors come to the shrine.
. The Water God 水神様　Suijin-sama . 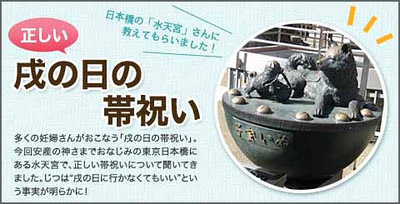 There are a lot of legends about Kappa fighting the humans in the area of the Chikugo river 筑後川. But in the end the humans won and 九千坊河童 Kusengbo Kappa became the protector deity at this Suitengu Shrine. 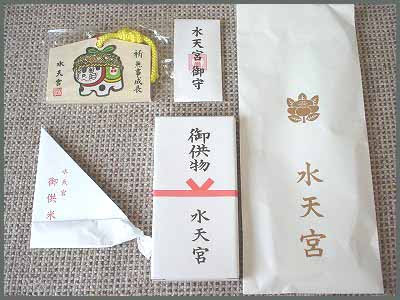 So there are some prescriptions for the Shrine worshippers to prevent water accidents.